As we all know, Bingo is a game that requires a lot of luck on the player's side. The fate of a win or loss determined by numbers on a ball matching those on your ticket is truly nail-biting stuff, and that's the fun thrill of the game! The other big thrill of bingo is the fact that you can make an incredibly small stake and walk away with quite the prize. Most bingo sites don't charge much for the tickets in the game; normally the higher the prize, the higher the ticket price. That was, until BOGOF Bingo's Value Nights, where the ticket prices have never been lower, and the prizes have never been higher! To take advantage of this offer, all you have to do is head over to BOGOF Bingo's main event room every Tuesday and Thursday, where from 6 pm until midnight, all regular game tickets cost just 5p! You can expect the same jackpots as usual, just for half the price! It's not just low ticket prices that are on offer. After 6 pm, you can buy a ticket for the BingoLinx game for just 10p which has a £500 prize, and buying a ticket for the special 10.30pm game will see you competing for a £1000 prize! 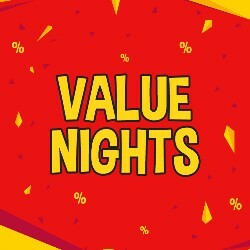 The Value Nights promotion runs every Tuesday and Thursday evening in the main event room 18.00 - 23.59. This is a Virtue Fusion network-wide promotion. All regular games 5p per ticket or less. 22.30 BingoLinx game 10p ticket price, £1000 prize.